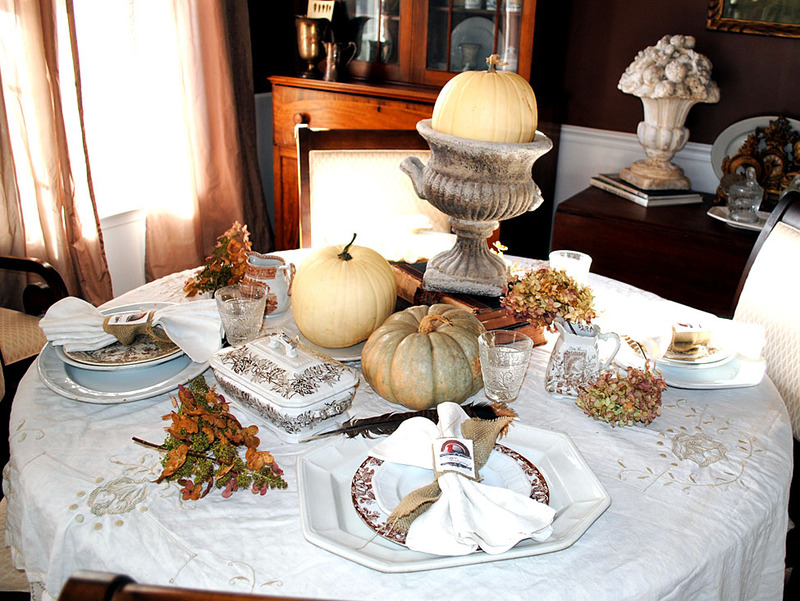 Even though I’m not hosting Thanksgiving at my house, I still think it’s fun to dress up our Table for this festive Holiday! I’m thinking we could have a nice little breakfast here that morning. Maybe a little toasted Pumpkin Bread with cream cheese, would be nice? 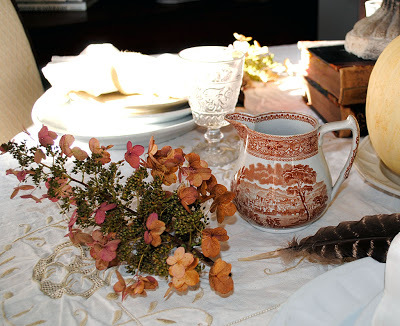 I layered up my table with my Grandmother’s Antique Lace table cloth and a Vintage embroidered Linen cloth that I picked up at a Flea Market a few years back. I added some Pumpkins and an old Concrete Garden Urn. For the China, I used lots of Antique Ironstone and Brown Transferware pieces from my collection, I don’t have a set of anything, I like to mix and match pieces. I think it’s more interesting that way! 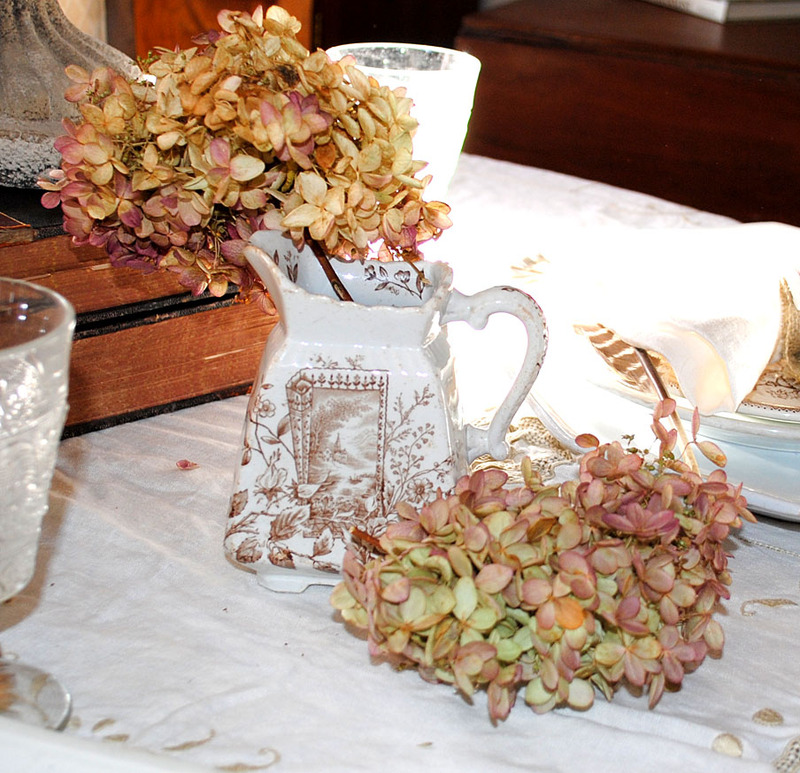 I also mixed in some Hydrangeas from my yard. The Goblets are Old Pressed Glass pieces, that were also my Grandmothers. I just love using my family pieces in my decor, I feel so blessed to have them, and they are all very nostalgic for me. 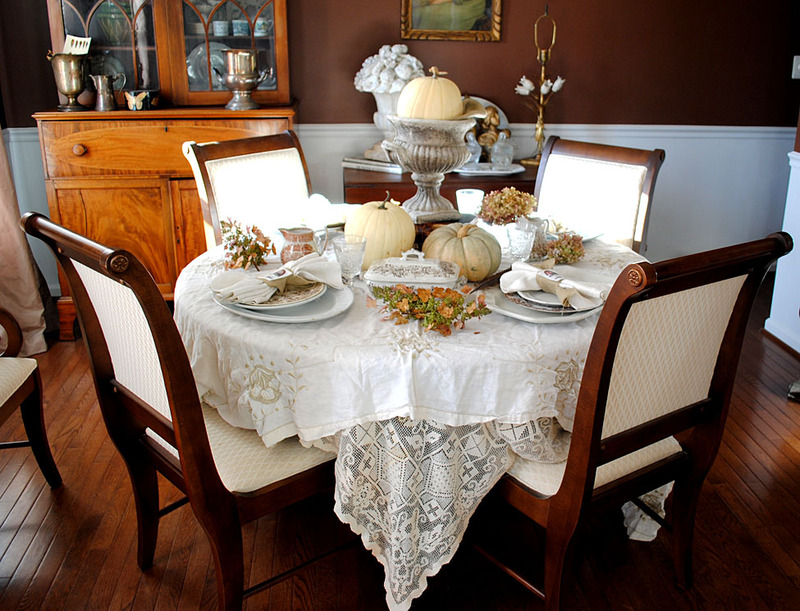 Do you have treasured family pieces that you’ll be using for your own Thanksgiving? The Turkey on the right is also a family piece and I managed to find him a friend at a yard sale recently! Instead of chargers I decided to use Ironstone platters. The napkins holders are the ones that I made in this Tutorial. 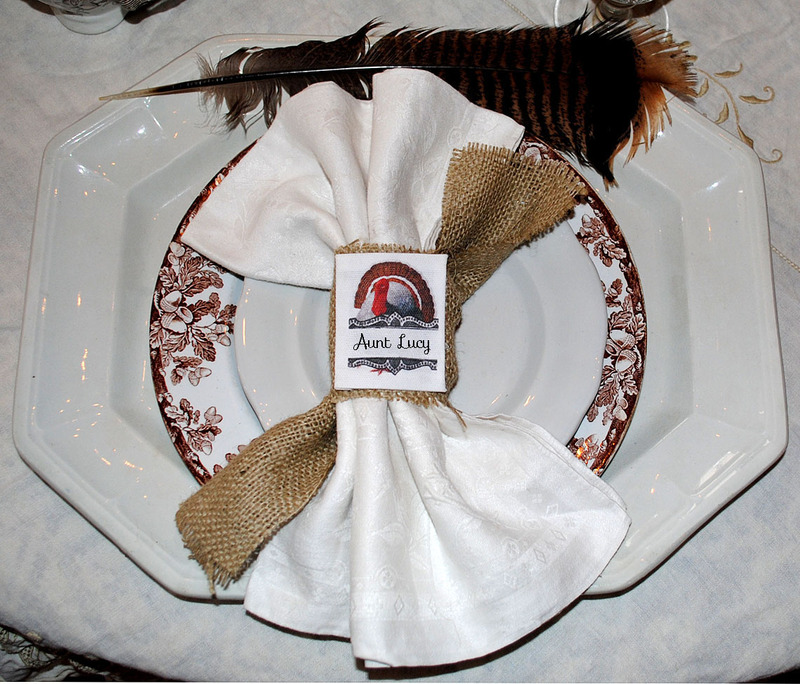 I topped each place setting with a feather found in the wild. I just realized I didn’t put the silverware on yet! Oops! Oh well, I guess we don’t need them quite yet anyway. 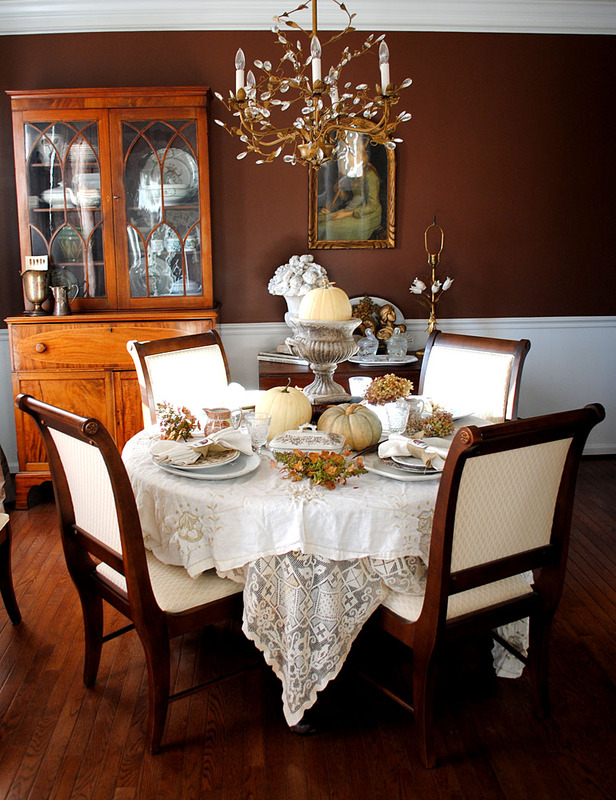 I’m really looking forward to Thanksgiving… it’s one of my favorite holidays! So Beautiful! LOVE IT! And LOVE, LOVE, LOVE your wall color! Do you mind sharing the color? Thanks. Have a wonderful Thanksgiving. Thank you so much! I just checked my paint stash, it looks like I used Ace Hardware paint, the color number on the bottom is listed as 127A. Not very descriptive is it? It probably has another name, but hopefully they can find it by the number. I hope that helps! That’s great!! Let me know how it turns out! Thanks for your sweet comment Solange, I like how you put that!! Your table and decorations are incredibly charming! 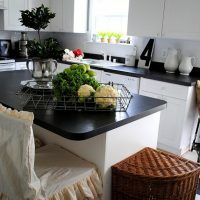 What wonderful memories you’ll be creating sitting around this with family! Oh you are so sweet!! Thank you Susan, I’m glad you liked it! Your tablescape is so much more than just decoration. 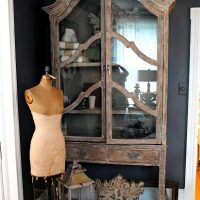 I adore the history of some of the pieces, and the memories it must hold for you. My MIL sets the most beautiful tablescapes and is just starting to share some pieces with me. Hopefully some day I will have a little “History” set on my table! Thanks for sharing your beautiful table and gorgeous pieces! Thank you Pendra, you always leave the most thoughtful comments! 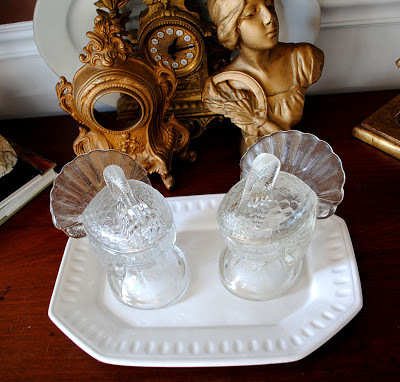 How lovely that your MIL is sharing some of her treasures with you! What a creative ideas for elegantly preparing your home for Thanksgiving guests. Love your ribbon napkin holder…Mine, I use an ornament for napkin holder. Thanks Maxie!! Ornaments are great for napkin holders too, I love that look!